A list compiled by Khaled ElAhmad of the Most Influential Arabs on Twitter according to their Klout score. Twitter now has over 300 million people tweeting 250 million tweets per day. There are 652,33 Active Twitter users (who tweet at least once a month) in the greater Middle East, according to the 3rd Arab Social Media Report. Arabic accounts for 1.2% of all public tweets, and Arabic tweets have grown in volume over the past year at a staggering rate of 2,146%, according to Paris-based firm Semiocast, as The Next Web reports. When it comes to influence, Twitter lists have been generated to measure who has the highest number of followers, but is the number of followers an indication? Or there are other measurements? Klout is one website that claims to accurately measure a person’s online influence, using 35 different variables on Facebook and Twitter to measure “true reach,” which is the size of your engaged audience, based on the number of followers and friends who actively listen and react to your messages. It also measures “amplification score,” which is the likelihood that your messages will generate actions (retweets, @messages, likes and comments). Another metric is your “network score,” which indicates how influential your engaged audience and gives users a total score out of 100. This algorithm uses data points that include your followers, re-tweets, list memberships, your engagement with other users, their influence, mentions, and whether accounts that follow you are just spam accounts. Klout also deducts points if you are absent from Twitter or Facebook, so it is a decent indication of how active you are online. There have been few attempts to list top Arabs on Twitter, but often these lists only ranked users by the number of followers. While this is one way to look at it, I think it should be based on multiple variables that measure online influence, a bit closer to what Klout is doing. 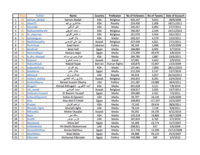 So I put together a list of the Most Influential Arabs on Twitter according to their Klout score. I used websites like tweet.grader.com to find the top 50 Twitter users in the major Arab countries. I also collected the top Twitter users http://mtwtron.com/top_users. I then took only those users who have a score of 59 and up, and took the top 100 scores descending from 100 down. Bear in mind that while this list was compiled on Saturday, January 21st, 2012, it’s an evolving entity, as these scores are variables. So it could fluctuate according to a given user's level of engagement. All whitepapers are available to you and free of charge. This whitepapers is provided by Wamda.